Wednesday was a busy day. I got no writing done, but it still felt productive, mostly because I spent the day as if I was wearing this T-shirt. 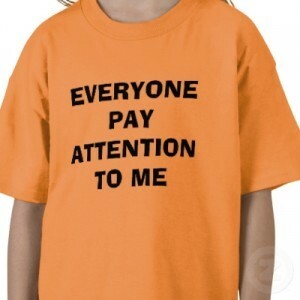 Everyone Pay Attention to Me! As I said, it was a busy day. Who knows if this effort will pay off, but I’ve seen other anthologies disappear without a trace because the editors did little or nothing to promote them. I owe it to the contributors, and to myself, to try to do better. ← It’s Publication Day for Everywhere Stories!